We take a trail through the woods to the “Bergschenk Krin” mountain restaurant where you can enjoy a quick coffee and cake stop, before continuing on to the top of the Ehrenbachhöhe mountain at 1880m above sea level - the views from here are spectacular. Our return to Kirchberg takes us through pine forests and over the resort’s ski slopes now wonderfully peaceful, apart from the occasional chime of an Alpine cowbell. 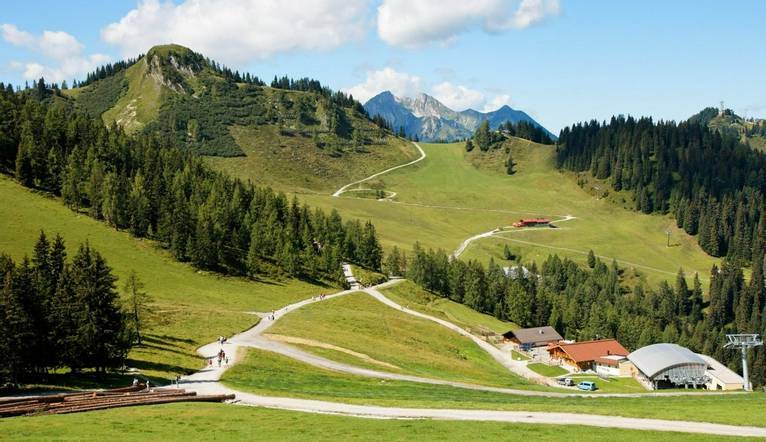 Our comfortable hotel is surrounded by the beautiful grassy mountains of the Kitzbühel Alps at an approximate altitude of 900m. Facilities include a sun terrace, sauna and lounge, plus a restaurant and bar. Room facilities include a flat-screen TV, radio and hair dryer. Free Wi-Fi is available at the hotel. The transfer time from Salzburg Airport to our hotel is approximately 1.5 hours, depending on weather and traffic. Four guided walks are included in the programme. Your walking guide will advise you in resort of the daily programme. The walking programme is graded as Medium and you can expect to walk between 8 to 14km per day, with some ascents/descents, rough underfoot terrain and high altitudes involved. There will be plenty for you to see and do during your own leisure time during the course of your holiday, full details of which will be given out at your Information Meeting by your Tour Leader with prices (depending on group size). Your Tour Leader will help arrange these for you and explain where you will need to go but may not necessarily accompany you.